Instead of hiring new Immigration Judges to tackle the profound immigration backlog of approximately 685,000 cases pending or expanding the court, Attorney General Jeff Sessions and the Trump administration will now be pressuring current Immigration Judges to process cases faster by establishing a quota system tied to their annual performance reviews. In particular, starting in October, Immigration Judges will be expected to clear at least 700 cases a year to receive a “satisfactory” performance rating, a standard that their union called an “unprecedented” step that risks undermining judicial independence in addition to compromising levels of judicial integrity and due diligence. Reportedly, the proposed system also sets up additional bench marks, penalizing those who refer more than 15 percent of certain cases to higher courts, or judges who schedule hearing dates too far apart on their calendars. Judge A. Ashley Tabaddor, President of the National Association of Immigration Judges (NAIJ), said the quota system could introduce an “appealable” issue and invite a host of complex legal challenges. “We don’t know of any other court whose judges are subject to individual quotas and deadlines as part of performance reviews and evaluations,” Tabaddor said. Critics are describing the new approach as a veritable assembly line, not a judicial system, that runs the risk of subverting due process. Likewise, many immigration advocates and immigration attorneys are concerned that the imposition of quotas is really a Trump-era pretext for speeding up deportations. 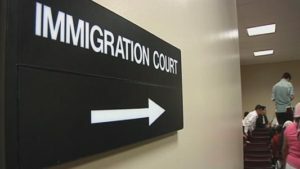 Immigration Lawyer Edward Shulman the former Chairman of the New Jersey Chapter of the American Immigration Lawyers Association (AILA) weighed in on the new quota system by first highlighting how hard Immigration Judges already work. He explained how a certain number of postponements and continuances are the result of technical and other operational problems in the courtroom, or government attorneys admitting to not receiving the immigrant’s file in time for court, or the fault of the Department of Homeland Security, such as not having the detained immigrant available for the hearing. These are not the fault of Immigration Judges and they should not be penalized for a system that requires re-working and re-structuring. Shulman also vocalized concern that Judges who may be lagging behind in closing cases may decline to hear an important witness or refuse to admit further evidence which will render the system more unfair. “Many immigration cases have significant life-or-death consequences where families may be torn apart and individuals forced to return to a country they left as an infant or one in which they are an active target for persecution and gang violence. Disallowing a comprehensive and careful hearing would not only deny these individuals their due process but could result in deleterious consequences.” Shulman further stated that there may likewise be a paradoxical after-effect which may result in a backlog of appealable decisions caused by the pressure for haste.